Divide dough into 5 equal parts. Tint each with a different gel food color (red, orange [mix red and yellow], yellow, green, blue), and add 2 tablespoons of the flour to each to keep from becoming overly sticky. On work surface, place 2 pieces cooking parchment paper. Sprinkle a bit of the remaining flour onto 1 of the pieces of parchment paper. Use rolling pin to roll red dough to 8x3x1/4 inch. Transfer this dough to other piece of parchment paper. Repeat with orange, yellow, green and blue pieces of dough, placing each color on top of the other until they are all stacked in rainbow order--red, orange, yellow, green, blue. Use sharp knife to cut edges of dough to even out rectangle. Starting at long side of dough, roll up. Sprinkle parchment paper with sparkling sugar. 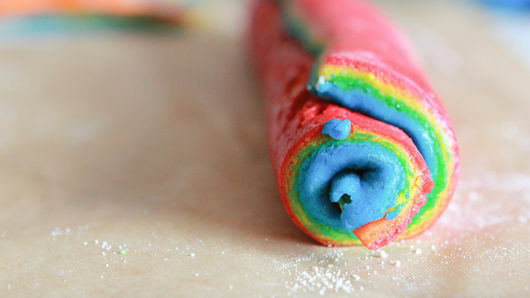 Roll dough gently in sugar until coated. Cut into 1/2-inch slices with sharp knife, then press one side of each round into sparkling sugar. Place on ungreased cookie sheet, sugar side up. Bake 7 to 10 minutes or just until set. Cool slightly before removing to cooling rack. Go team! 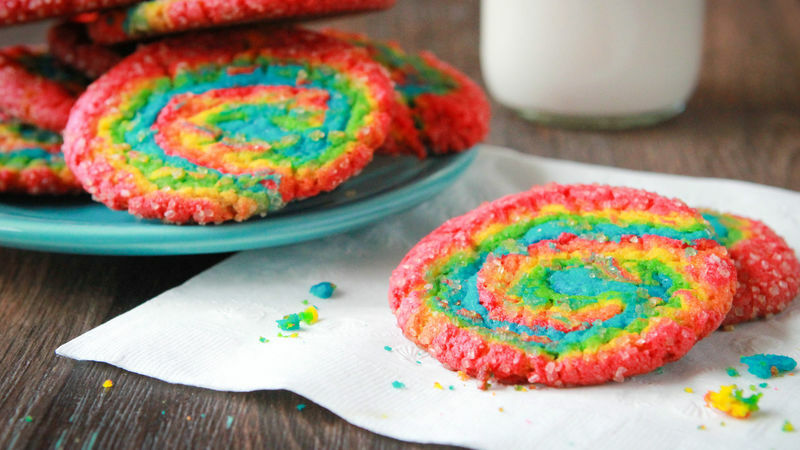 Mix the rainbow colors and make these cookies using just two colors--the colors of your favorite team. Get neon! 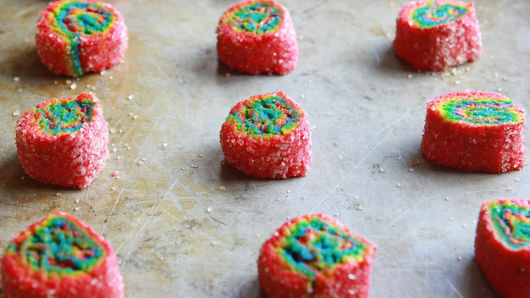 Try making these cookies using neon gel food colors for some extra-fun oomph!